Who doesn’t listen to music? Besides the ubiquitous MP3 players we see dangling from people, a substantial amount of individuals get their audio fix from online radio stations: many choices and styles of music, and just a click a way. Richard White is the CEO of one of them, BigRradio.com. He is our new Featured Publisher. VP: How did you get interested in web publishing originally? What were those early days like for you? Richard White: Web publishing started with me in 2001. My first site I built was The Edge FM. The most challenging thing back then was coming up with ways to make our site self-supporting. The only source of revenue back then for ‘Internet Radio’ was Banner Ads. Placement of the ads (in the fold) was crucial. One bad day could mean serious financial issues. VP: Can you tell us about your internet radio-focused website? Having this focus, are there any particular issues exclusive to your site that you had to overcome to make the advertising model work? Richard White: When we created Big R Radio in 2003 there were huge obstacles to overcome. Numerous issues arise when you have several internet radio stations streaming from one site; millions of people hitting your site all at one time, data bases frying, servers dying, and bandwidth usage out of control. Placing our banner ads properly and adjusting and readjusting until we figured out what works the best for us was and is well worth time spent. (Even though I complain about it 😉 ). Banner advertising is the consistent revenue maker for Big R Radio and our other sites. It’s dependable and they pay well. With other forms of advertising coming into the internet radio world as of last year, audio ads and banner ads are very complimentary with each other. And technology allows us to synchronize the two at the same time. VP: Why did you start using RMX Direct as your ad network management system of choice? Richard White: I was referred to RMX from a business partner of mine 6 months ago; we were looking for a more efficient way to manage all the different banner ad companies we were working with. Managing multiple sites, with multiple advertisers is quite the task. VP: What statistical changes have you seen since you started using it? For example, have your eCPM and revenue increased? Richard White: Since we started with RMX we have seen a consistent eCPM and of course our revenue has increased. The best thing about RMX is working with the many different advertising companies all in one site. It’s great. The other thing I think is great is the support from RMX. I haven’t used the forums much–that being said, I have browsed the forums and notice RMX replies quickly with professional answers. This is impressive and useful. Of course seeing all the banner ad companies compete for my impressions is something I have wanted to see for a long time! VP: Do you have any final thoughts, tips or tricks that you think others using the exchange might find useful? Richard White: I would suggest working with your RMX representative to fully utilize and learn the RMX system. It can be overwhelming at first, and you need to get it dialed in before seeing any dramatic results. VP: Thanks for being part of RMX Direct, Richard! A few weeks ago I started a live case study of launching a website aimed at earning advertising revenue, the VoFiles Project. It’s time to talk about how to determine a website’s initial advertising strategy in four easy steps, as well as our first update on the progress of VoFiles.com. I’ll talk in general terms about determining advertising strategy, and also describe how we went about it for VoFiles.com. Anytime you launch a new website, you should already have an idea of what plans you have for earning revenue. For the purpose of this discussion we’ll assume advertising is one of the main revenue strategies for your site. Now, where do we go from here? It’s not as simple as just deciding to go after advertising, there are many choices as to how you go about it, and you can often work with multiple strategies. Also known as brand advertising, directly-sold advertising, sponsorships, or endemic advertising, this is advertising you sell yourself, most likely to companies within your topic or industry. There are a few companies that can help represent your inventory for you, but most of them actually classify more as small ad marketplaces. This is generally the most lucrative form of advertising, but it usually requires a high traffic site or a site that is a leader in it’s topic. It also requires the most amount of effort to sell, manage, bill, and invoice. The bottom line is that very few new sites can sell premium advertising right off the bat unless they start out with a lot of momentum and a connected management team. I’d generally suggest planning for this later down the line when a site is more established. Most people will simply know this as Google Adsense, but there are other players of course like the Yahoo Publisher Network. This type of advertising can be a huge success for a lot of focused sites in certain industries. The pages of your site need enough content to allow the contextual engines to find appropriate ads, and you need users that will take some action and click on ads. This is a common choice for a lot of new sites, and it’s generally easy to setup. One thing to be aware of is that it can give your site a less than professional feel if you’re really looking to sell high quality targeted ads in the future. There are some other contextual solutions that offer some different things like Amazon Omakase, Chitika, and Quigo Adsonar. One of the most popular forms of advertising is general display ads like banners, leaderboards, skyscrapers, and rectangles that are supplied by a bevy of ad networks. This is very easy to set up, and because most of the networks pay on a CPM basis you earn revenue whether uses click on ads. Sites that don’t have much content or may be more general in nature will usually find better results with this than contextual networks. Many networks do have strict requirements on what type of sites they’ll accept and also have minimum traffic requirements. It’s also a very natural lead in to selling targeted display advertising in the future as your users won’t notice much difference except an improvement in targeting and relevance most likely. The networks in this space have different specialties, strengths, and weaknesses. Some of the major players are Remix Media, Burst Media, Valueclick, Tribal Fusion, Advertising.com, CPX Interactive, Tacoda, and more. Of course, I could talk for hours on how this type of advertising should be auctioned through an exchange like the Right Media Exchange using a product like RMX Direct, but we’ll save that for later. Cost Per Action (CPA) and affiliate advertising is a high risk/high reward form of advertising that works amazingly well for certain publishers, and horribly for others. The premise is that you get paid when you drive a user to an advertiser who pays you when that user performs the action the advertiser wants them to perform. This works really well for sites that recommend users buy things, or other classic affiliate sites like ring tones, software, ebooks, etc. There are actually affiliate networks like AzoogleAds and Commission Junction, but often you can work directly with an advertiser like Amazon. There are companies that sell text links on your site like Text Link Ads and Adbrite. Also companies that can sell ads in RSS feeds like Feedburner and Pheedo, or other marketplaces like Adify, Adster, and Performancing. For VoFiles, we knew that selling premium advertising was probably unlikely because of general content as well as the social network audience not being the most desirable to advertisers. The trade off is that because VoFiles is in the booming social networking space, we’re hoping to use sheer traffic volume on ads that pay less to generate revenue. Which is easier? A targeted site is probably easier, but we wanted to explore the social networking “studio space”. Now that we know that our goal is to aim for traffic volume we can plan accordingly. Because our pages are not filled with focused content, contextual advertising is also a bit of a challenge, but still possible. The obvious choice was to start off with display advertising networks, with an eye toward the future in contextual ads as well as text ads and joining a few marketplaces. After evaluating all those options, it’s time to choose your tool. The most common tool used to manage web advertising is ad servers. They generally can manage graphical display advertising whether it’s premium or ad networks, contextual advertising, and affiliate advertising. Very few do much with text links at this point. There is quite a range of ad serving options. You have everything from an ad server meant for premium like DART from Doubleclick, to a smart ad server like Right Media’s PMX product made for yield management and maximization or remnant inventory, to something free like phpAdsNew. Most ad servers do have fees associated with them since they provide bandwidth, support, hosting of data, and other services. If you are just getting started with advertising on your site, or you are primarily working with contextual or display ad networks, then a revenue management platform like RMX Direct is the best choice for you. RMX Direct is neither an ad server alone or an ad network, but combines the best of both worlds while allowing you to manage and auction your inventory to any ad networks you’re working with, as well as work directly with ad networks on the Right Media Exchange through the tool. It’s a free tool which makes it easy to get up and going and monetizing your ad inventory right away, while also not locking you into working with one ad provider. There are quite a few other random blog plugins, PHP scripts, and purchaseable tools that can be used to help manage your ad inventory in various ways. There are too many list, and not that many I’d really recommend. When we looked at tools for VoFiles.com, we knew that premium advertising was most likely not going to be a huge part of our advertising mix, so RMX Direct made the most sense for us as a way to manage our ad network relationships. It not only allows us to get all the networks and advertisers on the Right Media Exchange auctioning for our inventory, but allows us to auction ad networks like Adsense, Yahoo Publisher Network, Valueclick, and more. If we end up using some of the various ad marketplaces, we will most likely just have to place their code directly on our pages as they don’t fit their ads in standard ad sizes. After you have your types of advertising picked out as well as the tools in place to manage it all, it’s time to choose where to place your ads on your site. This is something I refer to as the “advertising balancing act”. As a publisher, you want to make as much money as possible. In order to reach that goal you need to place ads where users are most likely to see/click/act on them. However, this usually leads to a worse user experience on your site as ads can make your design and usability worse, they can distract users from their core tasks, or generally just get in the way. An argument can be made that really highly targeted and useful ads can help a user’s experience, but generally this isn’t the case. So how do you balance the need to make money with the need to please your users and keep them coming back? Unfortunately, there is no easy answer to this equation, it’s really up to you as a publisher to analyze how much advertising your users will put up with and where it should be placed on your site. I’ve seen sites that are successful with very little advertising that blends in perfectly with their site, and also seen sites that have blatant and annoying advertising all over the place that users seem to deal with just fine. I can recommend look at the heat map provided by Google Adsense to get a general idea for which areas of a web page usually see the best ad results. The darker the color on the map, the more successful ads are in that area. As you can see from the map, the best place to put an ad is smack dab in the middle of a page where a user is used to seeing real content. So that ad space is the most valuable, but also the most annoying spot for users to see an ad. For VoFiles.com we decided to place our ads in standard locations without getting too much in the way of the user. Our 468×60 banner ad is placed in a central location near the top of the page. 728×90 leaderboard ads usually pay more, but didn’t fit into our design. 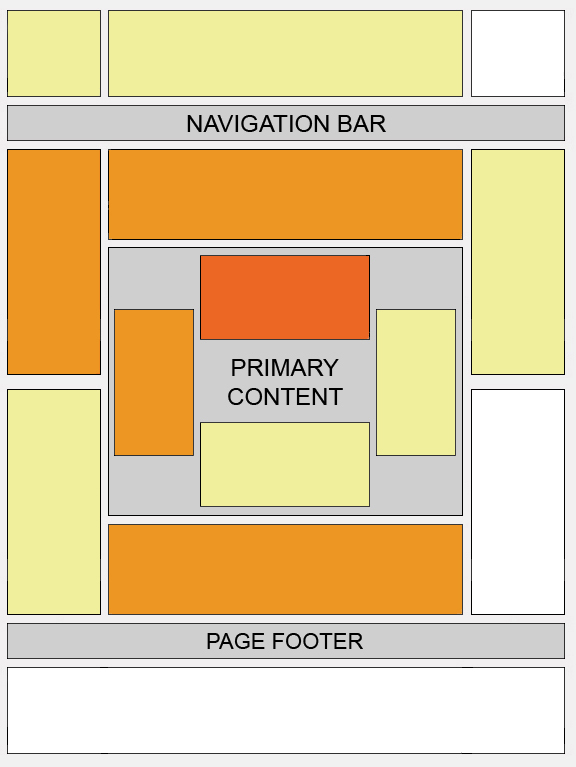 We put a wide 160×600 skyscraper about middle way down the page on the right side in the column, and then on the actual profile content pages we add a 300×250 rectangle box in the middle right under the meat of the content. We will most likely add more ad placements on the page over time, as well as some text ad advertising in the right column. The last piece of the puzzle which often separates publishers from decent success to great success is continuing to monitor your ad results and continually test. Just like with web analytics, analyzing advertising results is very important to recognize changes and make the most of your ad inventory. Using a good ad server or revenue management platform like RMX Direct will help you have access to good reporting data that will allow you test different ad placements, geotargeting, frequency-capping, and other techniques to squeeze the most revenue possible out of your inventory. Most people just think moving around where your ads are located is all there is to testing. While that is a great thing to test, don’t forget to test other ad sizes, and most importantly test as many ad networks, ad marketplaces, and different advertising avenues as possible. Also, tests should be rerun in different times of the year, because what worked in January might have different results in July. Instead of weekly statistical updates as I had suggested, I’m going to do monthly updates on VoFiles statistical progress. It’s unlikely I would really get weekly updates accomplished, and in most weeks there probably wouldn’t be much change worth noting. December will be the first full month of stats for VoFiles, so we’ll do a first month stat update at the beginning of January. Regarding the progress of the site, we haven’t really done much marketing at all yet. We’ve added some profiles, and done some informal user studies which has taught us that many social network users don’t really get what to do on VoFiles since they aren’t used to the voting concept made popular by Digg. The quickest solution is to add more obvious instructions, but I think for long term success we need to change to something along the lines of a monthly voting model. Basically, the votes will last for a month so that a user could be voted “Best Profile Layout” for the month of January. This should be easier to understand, provide something for users who have profiles submitted to shoot for, and hopefully lead to more viral spreading of the site among social networks. We also need to develop some badges for profiles to promote voting or show that a user has won a VoFiles monthly category. It has proved to fill our needs in some ways so far to test various parts of RMX Direct, but we definitely need more traffic and users to be accepted by other ad networks and get a full geographical spectrum of users. It’s always a good feeling when people see the possibilities in something you’re involved in, and Matt McAlister of Yahoo is seeing the light with RMX Direct. His description of how the application works is pretty accurate, although I would add that it not only allows publishers to get ads from the networks that are part of our exchange, but it also allows you to auction and manage networks like YPN, Adsense, Valueclick, Feedburner, and others. I also agree with Matt that Feedburner is doing very interesting things, and their commitment to publishers is outstanding. RMX Direct is still early in its life, and we’re hoping to continually talk to people like Matt to explore the possibilities on ways publishers can interact with and benefit from the Right Media Exchange. If you are a web publisher with an interest in advertising, I’d love to talk to you. As we continue to build RMX Direct at Right Media, the situation comes up where we need to test new features or debug a problem using a site that is owned by an employee so that it’s not a real customer having to test for us. Previously, we used to use a site known as Whoomp.com operated by myself, Cameron McNeeley, and Dave Barousse. It worked quite well, except that the site required the constant updating of content to keep up high enough traffic levels so that we could test effectively, and some ad networks require certain traffic levels to accept your site. We have jobs that we love as well as friends and family to be with so we didn’t have really have time to keep Whoomp.com going, so we sold the site. One might suggest that we just create some quick test site, but many of our tests require steady traffic levels, users from many geographic regions, and that we have enough traffic to get accepted by most ad networks. We must be able to create the site in a night or two of work. The site must have user-generated content so that it runs itself. The site should have some viral element so that it can grow to a decent traffic level without us spending time marketing it. Due to the nature of a lot of our clients, having social features or some relation to social networks keeps us in the same area as many of our clients. It must be suitable to run advertising on and get accepted by ad networks. Additionally, we decided it’d be great to “live blog” the launch and growth of the site so that we could educate our publishers and anyone else out there interested in starting a website with advertising as a revenue model. The focus will be on growing the advertising revenue, and how to work with RMX Direct to do so. We plan on sharing all our traffic and advertising revenue stats in the process. The proof is in the pudding right? I also plan on blogging about any successful marketing tactics, interesting stories, or anything else that seems blog worthy related to it. After 15 minutes much deliberation, we came up with VoFiles.com. VoFiles is a play on the Digg-style voting site, except changed to voting on social network profiles in different categories. Is it a unique and genius business model destined for huge success? No, but we hadn’t seen such a site for voting on profiles, and it satisfies all the criteria laid out above. It was quick to build using the open source code from Pligg, word has already started to spread a bit and random people are adding content, and if it catches on in any of the social networks we should be able to generate enough traffic to make it a site we can test with. Naturally, we can use any help you can give to get the ball rolling. If you’d like to link to VoFiles, submit profiles, vote on profiles, subscribe to the RSS feed, or provide any suggestions, you are welcome to do so. Expect a post soon outlining our initial advertising setup and strategy. I’ll be representing Right Media at the TechCrunch Party in New York this Thursday night. I’ll be giving live demos of RMX Direct, as well as socializing and having a good time. If you’re attending the party, be sure to stop by the Right Media demo table and say hello. 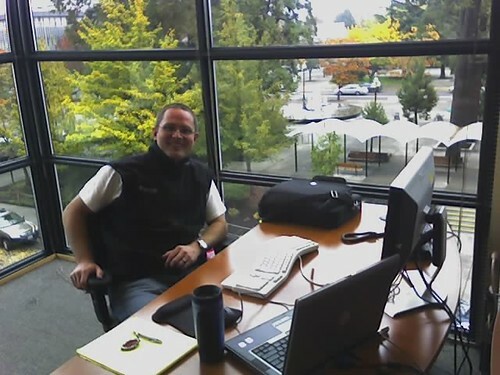 Because being open and transparent is all the rage, we just moved our Oregon office at Right Media into a new office space that is both open, and in fact very transparent. 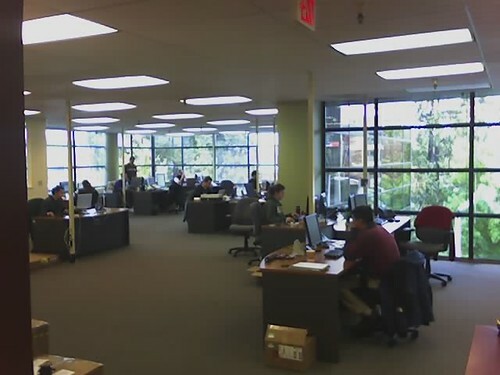 Our previous space had closed offices and lots of walls, and now we’re basically all in a big L-shaped space that has floor to ceiling windows overlooking a nice park with trees and a fountain. It’s also home to the famous Eugene Saturday Market, the USA’s oldest weekly open air crafts festival. I prefer it for the food. Unfortunatley, our RMX Direct development manager Joe Garstka scored the corner space, and you can tell he’s smug about it. Overall it’s a nice change of scenery, and everyone seems to be very productive so far in the new environment. We’ve had some great publisher success with RMX Direct during a beta phase and we’ve been highlighting a publisher each month on our Right Media blog. I thought I’d pass one along here as well for those aren’t following the blog are using RMX Direct. Vince Panero (VP): How did you get interested in web publishing? What were those early days like for you? Steve Jenkins: It started as a hobby while I was in college in 1994. I started a Windows shareware and networking site called “Windows95.com” (and later named it “WinFiles.com” to keep up with the changes in operating system names). The early days of $30 CPMs were great! VP: Can you tell us about your website? Steve Jenkins: CheatCodes.com is the #1 online resource for video game help. We offer cheats, tips, FAQs, walk-throughs, and more for all the major console and PC gaming platforms. It was co-founded by myself, a close friend Steve Cook, and my brother Harlyn. VP: Did you get into this with the idea that you would make ad dollars from your site? How did you initially monetize your site? What problems did you encounter utilizing this method? Steve Jenkins: Absolutely. Having run content sites before, we knew we would be mostly advertising driven. We initially monetized our site trying to juggle a few different ad networks, but it was way too difficult to manage. So we opted on just one. We knew we were missing out on available revenue, but the convenience of only having to manage one relationship (and one set of ad tags) forced us to do it. VP: Why did you start using RMX Direct? Steve Jenkins: We decided a while ago to start using more than one advertising network again, so we added the Right Media Ad Network . Then you guys contacted us and said “hey – we’d like you to try the beta of our new system, RMX Direct.” We’re always up for an experiment, so we gave it a go. Steve Jenkins: We’ve doubled our eCPM and revenue within a month. It was drastic. We are kicking ourselves for not doing it sooner. VP: When you tested your primary networks in RMX Direct, how did you do that? Steve Jenkins: We added them to our Manage Tab and artificially inflated their CPMs for a week to see how they could do. Then we set their CPMs at their actual levels, and then we adjust them every week. VP: What do you like most about RMX Direct? Are there helpful parts of it that other ad management interfaces simply don’t offer? Steve Jenkins: We love EVERYTHING about it. Mostly that it’s easy and effective. We also love the community element. We hope that survives the beta period. It’s great to be able to learn and share information with other web publishing professionals. VP: If they aren’t ‘confidential’, do you have any tips or tricks that you think others using the RMX Direct might find useful? Steve Jenkins: Nothing confidential. Just add as many networks as you can manage, and let them fight it out. We’ve received a few phone calls from some of our ad partners complaining that the impressions we send them are much lower than before. We tell them that they are being outbid, and the simple answer to get more inventory is to pay us more money. They are usually at a loss for words. VP: Do you have any final thoughts on this “exchange concept” (network transparency and competition, the fun of having just one login, the analysis piece, etc.)? Steve Jenkins: It rocks. Hard. Like 80s hair-band hard. THAT hard. We thank Steve for participating in our monthly “Featured Publisher”. We just launched a new version of the Right Media website. I think it’s a vast improvement over the old version in that it combines the voice of our employees with actual descriptions of what both the company and our products do. For a quick overview, try the Tour on the front page, or feel feel to dive into products specifically. A couple of cool areas to check out are the RMX Direct section, and the RMX Members page which will start adding customers like mad. You can also grab a badge there like the one you see in my right sidebar if you want to support the movement for an open and transparent advertising exchange. Rock on.